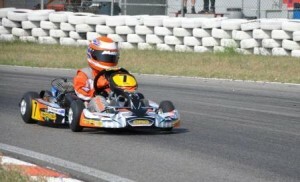 Alex Peroni (Tas, AUS) has ventured all the way to Italy to gain invaluable karting experience from one of Europe’s top kart racing teams, Gallifa Racing. Alex, along with his family have also been joined in Italy by Stan and Julie (prop Concept Karting). The following brief report was sent by Stan after a successful two day test. Alex Peroni testing at Sant’ Egidio, Italy. The testing consisted of two days of intense familiarisation with the different track, engine, chassis and tyres to those used in Australia. 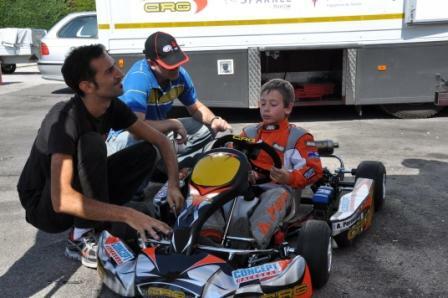 Alex was professionally assisted by the well respected Italian race team headed by Alessandro Ottaviani who himself was for many years CRG’s official team racing driver and his most capable son Simone. So far Alex has handled the different conditions presented to him with great promise. Alex will next be travelling north to Pavia where he will have a taste of hard competition against Europe’s finest young drivers in the 60cc Mini Class.